Australian shepherds are just about the more adorable, loyal and energetic dogs you’ll ever meet. Always up for playing and running, these dogs are the platonic ideal of ‘man’s best friend.’ As such, you want to make sure your best friend is getting the health and nutrition that they need; after all, in addition to exercise, diet is the most important thing to keeping them in fighting (and barking) shape. 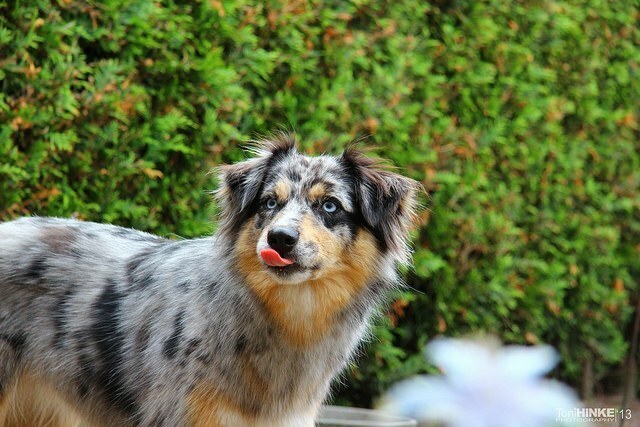 Check out our comprehensive guide for the best dog food for Australian shepherds, and you’ll be that much more prepared to feed your shepherd right! What Are an Australian Shepherd's Calorie Requirements? The average weight of an Australian Shepherd is a about 50-65 pounds for male dogs, and 30-45 pounds for female shepherds, making them a decently medium-sized breed. Presuming about a 60 pound Australian Shepherd who has about a normal rate of activity and is in good health, you’ll want to give them about 1313 kcal/day. For those shepherds that spend a little more time running and fetching than most other dogs, you’ll want to up your dog’s food intake to about 2088 kcal/day. On the other hand, if your dog is getting on in years and is a bit less active than they used to be, you might try decreasing their food down to 1074 kcal/day. Keep to about these measurements, and you’ll be able to manage your dog’s weight and nutrition no matter how old or active they are. This video about the Australian Shepherd is extremely informative, including a history of the breed, how to feed and care for it, and more. Plus, it’s just got some cute footage of those adorable dogs playing around and having a good old time – which is really what you want most out of this page, let’s face it! Just like many other types of dogs, Australian shepherds need to get plenty of strong animal proteins – it’s the key to building strong animal muscle and increasing strength and vigor. Make sure that good, natural animal protein is the chief source of your dog’s nutrition. Be sure to look at the top five ingredients of a dog food when you think about purchasing; if there are two or more grains, your food probably possesses more plant protein than animal protein. It’s important that you keep a close eye on the makeup of your dog’s food – you don’t want to sacrifice health for affordability. In terms of fat, you want a higher than normal fat content for your Australian shepherds, so you can make sure that their big, fluffy coat can remain shiny and healthy. While you may balk at the idea of giving your dog more fat, keep in mind that there are healthy fats; animal-based fats like fish oils and the like are crucial to your Aussie’s diet, as they promote heart health and can be easier on your dog’s metabolism. Sure, you don’t want to make your dog too fat by gorging them on carbs and empty calories, but healthy fats will absolutely help them in many ways you might not think about at first blush. Because of that, don’t discount fats as something vital to dog nutrition. Carbs are something else to think about with Aussies; your dog needs them a lot more than you might think, as they’re required for all that energy your Aussie will need for its active lifestyle. As with all things, if you work to skip the filler and give them healthy carbs with things like good starches and vegetables, you’ll be able to incorporate them into your dog’s diet with no problem. Hip dysplasia. Like most dogs, Aussies have many osteopathic problems, especially if not properly cared for. Make sure your dog’s diet has plenty of protein and calcium, but not too much to avoid overgrowth and bone problems. Epilepsy. This can be difficult to treat in Aussies, so be sure to treat them with care when feeding. Urinary infections. Keep plenty of water close by and within easy access of your Aussie. When you have an Australian shepherd, make sure to feed them 1.5 to 2.5 cups of high quality dry food per day, splitting that between two meals. (Check out the calorie information we gave above to measure out how much your dog should be getting per day.) Don’t leave food out all the time, but instead measure out the food and give it to him during these specific mealtimes. If you want to test whether or not you’re feeding your shepherd enough food, you can give him the ‘eye test’ and the ‘hands-on’ test to check your Aussie’s weight. Look down at him from above to look for a waist. Then put your hands on his back, placing your thumbs along his spine, spreading your fingers down over his ribcage. If you can feel his ribs, but not see them, he’s fine; if you can’t feel the ribs without a little pressing, you might want to cut down on his food. Remember that you need to look out for your dog’s age, build, size, activity and metabolism when determining how much to feed your Australian shepherd. No one rule of thumb will work universally on every shepherd; you’ve got to feel out your dog’s individual needs with some general guidance. Not only that, make sure you get the best quality dog food you can – something specially formulated for your Australian shepherd’s specific needs. If you make sure to splurge on the good stuff, you’re more likely to get him the right nutrition without all the added colors, preservatives and filler of lower-quality feed. 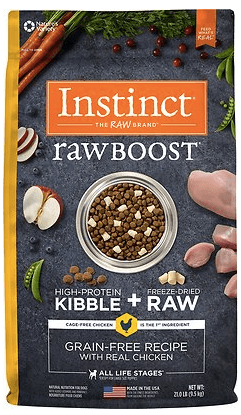 Since we all know how important it is to get the right dog food for your Australian Shepherd, we thought we’d take a closer look at Instinct Raw Boost, which provides a formula that just might be ideal for your Aussie. Like most high-quality dog foods, it’s a meat-centric formula that gives you nice lean meat in the form of boneless and freeze dried chicken, chicken meal, liver and turkey meal. It’s even got salmon and menhaden in there for the essential omega-3 fatty acids your Aussie will need to keep a nice shiny coat! Not only that, the non-animal proteins and ingredients show it to be a really solid feed, with eggs, peas, chickpeas, kelp, and other hearty vegetables to provide needed fiber and nutrients to your dog’s nutrition. There’s even some fruit in there with cranberries and blueberries to boost the vitamin content (and, we’re sure, the flavor!). There are quite a few fantastic dog foods for Australian shepherds out there – this is just the one we thought would fit best for most dog owner’s specific needs. However, there’s always more research to be done, so make sure to talk to your veterinarian and do as much homework as you can before deciding on a diet plan for your Australian shepherds.